Group Captain Chamberlain joined the Royal Air Force on 7th October, 1933, and was posted to No. 9 (Bomber) Squadron. He served with this Squadron until October, 1938, and then attended the Imperial College of Science and Technology for a period of three years. In May, 1941, he went to the United States of America and served on the British Air Commission in Washington until January, 1942. He then returned to England and was posted to H. Q. Air Defence of Great Britain. 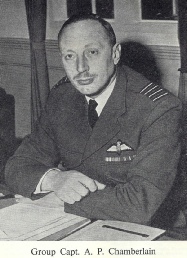 In September, 1944, he was posted to Austria, and was attached first to the Control Commission and then to the Air Division Control Commission, where he served until August 1946. From this post he was sent to Italy, where he was a member of the Air Headquarters Staff. On the 1st October, 1952, he returned to England and went to H. Q. Flying Training Command in the capacity of Command Engineering Officer. He served on Flying Training Command until December, 1955, and then returned overseas to H. Q. (Unit) 3 Group, stationed in. Germany with 2nd T. A. F., where he assumed the post of S. P. S. O. After two years in Germany he was posted to R. A. F. Locking, and on the 21st April, 1958, assumed command of the station. He is leaving Locking to fill the post of Deputy Director of Works Study at Air Ministry, and will take up this position on 25th May this year.